The purpose of How to Successfully Manage People by Jon Anshutz is to give you a better understanding of what it takes to effectively manage people. 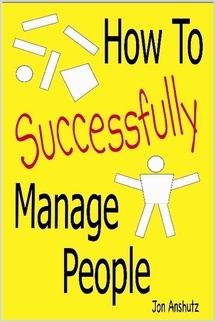 “How To Successfully Manage People” is a complete guide for managing. Anshutz goes out of his way to teach you the skills you will need to get the most out of your people. If you are serious about getting the most out of your people then you need to buy this book because it will show you how to create a “family” type atmosphere, how to set goals for yourself and your team, and so much more. No manager should be with out this book. This is part II of the post Identifying Strengths and Revenue Streams. What activities are you not just good at, but also feel good doing? What revenue streams do you have, no matter how large or small? What are some ways you have made money in the past, which you no longer do? What are some areas or ideas of things you have thought of doing, but for one reason or another never got around to doing? Have you noticed any changes in technology lately that would make something easier for someone to do something? Have you noticed a change in the demographics around where you live that might open a possibility for a new product or service? Have you noticed any “cuckoos in the nest” where something that wasn’t supposed to happen did, or something was an unexpected success? Have you noticed any examples of something that was supposed to succeed, but didn’t? What could you do to adapt to this new reality? When I was young I used to collect aluminum cans to recycle for money. As I got older I collected antiques to resell. Later on I bought books to resell online or through local book dealers. These were all retail activities which involved both labor and a product. Eventually I started trading labor for revenue, which is called service. I began doing computer repair and web design. Eventually people began paying me for my advice and I became a business analyst. Internet marketing is a mix of product and service because you are using your labor to help sell a product that you yourself do not deliver. The service is in the promotion, marketing, and advertising of the product. Anyone can do this using the free tools like the Thirty Day Challenge and other websites like Managing Actions which teach you how to be more effective by first changing how you think, in order to change how you act. In order to be successful, you’ll need to overcome obstacles. The first obstacle you’ll face is your own limiting thoughts so you’ll need to know how to deal with those right away. An example of a negative thought is, “I can’t raise $8,000 to $10,000 in 2 to 4 weeks. That’s impossible.” The first step is to realize that you are having a limiting thought, acknowledge it, then let it go. Just because your brain creates a thought, doesn’t make it true. Learn to manage your thoughts in order to manage your actions. The second factor is the people you associate with. In the same way that you have a greater chance of smoking if you live or hang around smokers or that you have a greater chance of gaining weight if the person or people you live with or work around are already overweight, if the people you hang around or not successful, are not following their dreams, or do not have multiple streams of income, then they are a limiting factor. If you want to change, then you’ll need to spend less time with these people. Erich: use all available tools and resources to build and promote the identified websites in order to profit from Internet Marketing. You: take some time to define the problems you are having, where you want to go, and what you want to accomplish, this will become your goal. Erich: measure the success or failure of the Internet Marketing campaign, determined by the metric, revenue per man-hour. You: brainstorm to identify your “strengths and streams” – find what makes you strong and what makes you weak, then write down all forms of income past and present. Erich: update the personal finance measurements with increased net worth, revenue, profit, and savings from the Internet Marketing campaign. You: manage your thoughts in order to better manage your actions. Notice when you are having a limiting thought, acknowledge it, then let it go. This is not a get rich quick scheme. This is about how to set a goal, make a plan, and execute (ready, aim, fire). There is no “thing” that can make you rich, if that is your goal. There is only you. Mitch Hedberg said it best when he joked, “I bought a jump rope — but man, that thing’s just a rope. You have to do the jump part yourself.” [Thanks, Johnny] No blog, no self-help book, and no business can help you succeed more than a determination and drive within yourself. If that is missing, everything else is just a rope.